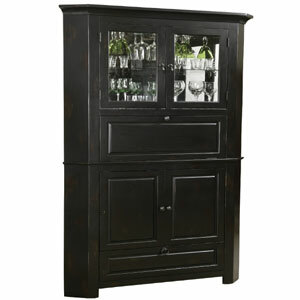 The Cornerstone Estates Wine & Bar Cabinet by Howard Miller is finished in a Worn Black with brown undertones on select hardwoods and veneers and features ample storage with a space-saving corner design. Upper compartment features heavily seeded glass panes in the front doors and contains an adjustable glass shelf. Middle compartment also provides storage and features a drop-down prep shelf for mixing and serving. A fixed shelf with glass insert allows light into the middle compartment. Revolving door with two fixed shelves provides additional storage. Lower two-tiered nested wine storage drawer holds up to 10 bottles. Hanging stemware rack keeps stemware handy. (Wall Dimension: 32-inch).